One of the films presented during the 58th Krakow Film Festival is the latest Marcin Sauter's documentary "I Grew Up As You Slept". We present an interview with the director and the protagonist, Karalina Orsik-Sauter. Daniel Stopa: Already after a fewmfirst scenes of your latest documentary "I Grew Up As You Slept" you can get a feeling that it is not a "classic" documentary. You combine black-and-white and colourful images and include shots from the Super 8 camera with an added voiceover. Up till the moment where two main characters - granddaughter and grandma - meet, you adopt a parallel narrative: sometimes we watch a lonely granddaughter in Poland and a moment later grandmother's daily life in Belarus. "I Grew Up As You Slept" is more of a documentary or fiction? Do you believe in such a distinction? Marcin Sauter: Of course, "I Grew Up As You Slept" is a documentary, and not more staged than my previous films. Is it classic? I don't know as I don't really know what a "classic documentary" means. Documentary film is a very comprehensive genre and it has already seen all kinds of experiments. I recreate the memories of the protagonist's childhood spent with her grandmother - these are those black-and-white fragments shot with the Super 8 camera. We could describe it as a fictional part, but it is based solely on the protagonist's memories. My first fiction film, which I'm finishing right now, was on the other hand made as a documentary. It is hard for me to establish exact boundaries - in my case they are very vague. A documentary for me is more about how you work and organise the set. When I make documentaries I have less money so what follows is less responsibility and as many days of shooting as you want. What is more, I have a minimal, best crew and freedom - as if I was constantly making amateur, independent movies. The film follows Karalina, a young emigrant from Belarus living in Poland, who goes to see her grandmother. Visiting a small village in Belarus is a pretext to explore emotions and sensitivity of the main characters. Is it hard to film loneliness, nostalgia, love? To express abstraction in a movie? M.S. : The real feelings are easy to film because they are visible. It is hard to film in a documentary emotions that are not there, but it also happens sometimes. For me documentary is a beautiful genre because the dramatic potential can be expressed by very subtle emotions, feelings and not much more. As for your question, for me in a documentary only abstraction is worth the effort. Logical, consequent chain of events does not interest me much as a film material. Emigration, which is a theme of my movie, is nowadays a real problem in Poland. We are at the same time emigrants and a country that accepts millions of immigrants from the east. I would like to talk about emigration in my own way, a human way. What is emigration for a single person? - for me everything comes down to that question. How does it hurt, what sad feelings does it evoke, how much does it cost? Lukashenko lies in the official TV speech about the Belarusian emigrants. And what are Polish politicians doing? How much xenophobia, intolerance and fear there is in our country. Those issues are very important to me and very current. It is in the national television that president Lukashenko assures everyone that bright future awaits the graduates of the Belarusian schools. But we learn about the real fate of the young Belarusian intelligentsia during Karalina's meeting with her friends. You talk about Karalina, but you also give voice to her generation? M.S. 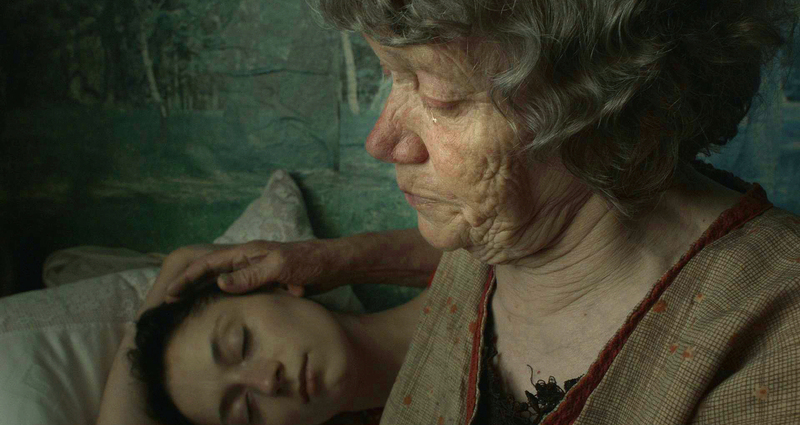 : Yes, the most important layer of the film if the feeling between the granddaughter and her grandmother, but I also wanted to show that Minsk is a ghost city. Thanks to Karalina I know how it looks from the inside. The fact that among her Belarusian classmates only one person still lives there tells you a lot. Truly everyone runs away from that country. Karalina Orsik-Sauter: I left Belarus when I was 19. I already knew back then that my country cannot secure for me further progress and dignified life. I have no idea where I found the strength and persistence to make my own way in a foreign country, even though I had no friends and no money and didn't know the language. My life in Poland has turned out beautifully. I have an amazing quartet with whom I can develop my passion, I teach at the Academy of Music in Bydgoszcz, I've met a lot of wonderful people. I must be really lucky. Yet I miss my homeland and this feeling is getting stronger with age. It irritates me when Lukashenko stupidly claims that young people have "bright future" ahead of them. If it's so good in Belarus, why does everyone leave? We're scattered around the world, cut off from our roots. We rarely see our families, friends. I miss Belarus. Marcin, for many years you've been both the director and cinematographer of your films. Do you prefer working "on your own"? What did it mean for this project? I'm the cinematographer of my documentaries because I've learned directing by looking through the camera. For many years I've been making amateur films like this and I guess it just stayed this way. Apart from that, I really like taking pictures and it also helps me to communicate with the cameraman. I'm also lucky to be blind in one eye, so when I put my other eye to the camera viewfinder I instantly jump into the film space. In the case of this film it was also the most natural thing to do. I was filming my family, I was close, with no crew. The sound mixer Marcin Lenarczyk was with us only during the most important period of shooting and the whole process took us a few years. Karalina Orsik-Sauter: I didn't really mind the camera. Maybe because the film was shot by my husband. I practically didn't feel the film was being made. Marcin was filming our family gatherings, meetings with friends, everyday situations. It felt very natural. Music plays an important role in the film. Karalina teaches at the Academy of Music, we watch long pieces of her rehearsals. As the director and cinematographer, what is for you the role of music in the film? And what was its role in the editing process? M.S. : Shostakovich's Sonata, which accompanies the film, is very beautiful and very sad. Also, Shostakovich all his life was dealing with the similar authorities as the ones in contemporary Belarus. In this music there's everything that I wanted to say in the movie, of course on the high level of abstraction. I envy musicians - they get straight to your heart, no unnecessary intricacies needed. There is a lot of music in the film. While editing with Kasia Orzechowska we intended for music to be an important binder of the film. In this sense it is a music film. The screening in Krakow is the first festival screening for "I Grew Up As You Slept". Where else will be able to see your film? In Krakow we have our premiere. The film is co-produced by Telewizja Polska and Belsat TV and it will be shown on these TV channels. I hope it will also find its way to festivals and cinemas. Usually everything begins at the festival in Krakow, which for me is a very important event. I hope it will also be shown abroad.